Edmund Dengler, eTrans Research Inc. and Leigh Whitcomb, Imagine Communications. Edmund Dengler, of eTrans Research Inc. and Leigh Whitcomb, an architect for Imagine Communications, presented a look at the risks that the move toward IP production are presenting to the broadcast industry. He then described how his firm was contracted to test the security of a major bank, and tapped into their systems through their own phone PBX branch exchange. 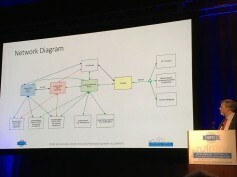 He then described the network diagram of a typical IP security system, showing its vulnerability with the statistic that in 2016, 35% of traditional TV companies suffered cyber attacks. A typical, vulnerable IP security system (click to enlarge). It’s apparent that the Essence Devices have unsecured management, and one of them is devoid of ST 2022-7 (“Seamless Protection Switching”) protection. “As systems are getting more complex, and stations have less staff, the situation is just getting worse,” Dengler said. So what can we do for protection? One solution is daily system upgrades, but the experts related tales of many organizations who had not upgraded their systems for over five years. Almost anyone could get access. After running an elaborate series of tests, what Dengler and Whitcomb would suggest is a network configuration employing SMPTE ST 2059 which describes how to synchronize video equipment over an IP network. A more secure IP nework with SMPTE ST 2059 (click to enlarge). It is based on IEEE 1588, which is the Precision Time Protocol (PTP) intended for local systems requiring accuracy beyond those attainable using Network Time Protocol (NTP) for clock synchronization between computer systems over packet-switched, variable-latency data networks. “This leverages the security concerns of industries like telco and banking,” Whitcomb said. “So by using some rather simple and actionable technologies based on SMPTE standards, also being worked on by folks like Apple, the Joint Taskforce on Networked Media and others, we can push the industry forward.